I realize that this is the second Fancy-Nancy-calender-inspired post in a row, but I can't help myself. Tomorrow is Sisters Day (although HolidayInsights.com says that the real Sisters Day was yesterday, since they say it's always the first Sunday in August. Meh, split the difference.). Why do they disagree? I'm thinking that it's because it's a fake holiday... But it's a great reason to talk about my sister. We're just warming up... I can't wait to see where this adventure leads! My mother would go nuts for these. You are wonderful, I almost have all my ideas for Christmas now. Nyan! You are awesome! You are inspiring the heck out of me over on your blog! Anytime you want to do a guest post over here you are more than welcome! 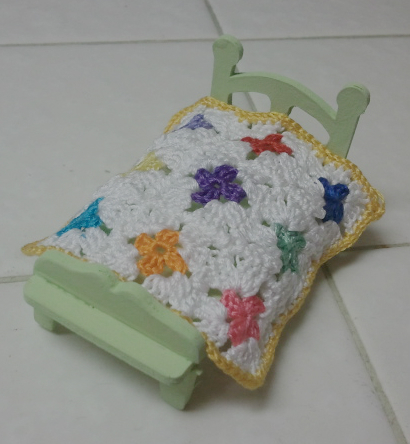 LOVE the granny-square bedspread quilt!! I knew you would, I wish it had been here on Sunday so you could have seen it in person. Oh darn, I guess that means I'll have to make another one for the 'double' bed that Sandy has... LOL!!! I hope it will lead you to miles of pure joy. I have done just like your sister and I enjoy my new doll's house so much . Hi Line! I hope so too! 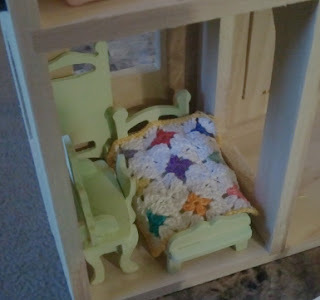 Have you done any crocheting for your dollhouse? I have and I keep improving It. Crochet is perfect for carpets, cushions and plants! Plants! You are brilliant! Ooh, my sister would love it if I made her some plants! And carpets! Sue, you are too sweet! I just read this to Jake and he said that it meant that you thought I was lazy for not using my Twitter account... LOL!!! LOL!!! Jake is a modern man! Having weirdo husbands is part of our joy in life! I'm not sure what I would even do with a normal one. You both will be pleased to know that I've now linked up my Twitter account to the Crochet Dynamite Facebook page... and I've started a 30 day Twitter challenge... LOL!!! I am so excited I found your blog recently through a pattern site and I'm in love with your creativity. 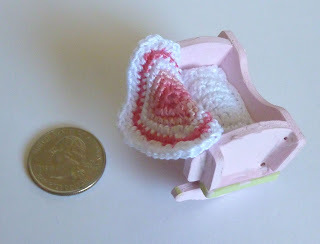 I love miniatures as well so wherever this journey takes you I'm happy to be along for the ride. Oh my gosh this is too cute awesomeness! ♥Piper♥!!! Thank you so much! It was really fun. I used 3 strands of embroidery floss, which was neat to crochet with but a total pain to separate.